"May the Peace of the Wilderness be with you"
Rumor has it - When God takes a vacation, he goes to a Colorado Wilderness! Take a trip into Colorado's Wilderness Areas. Explore the wilderness and towns surrounding the wilderness of your choice. 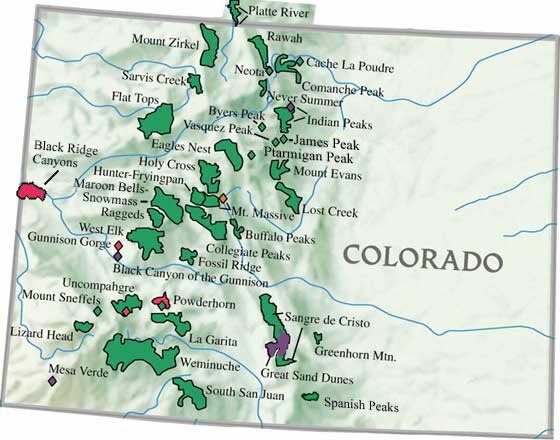 This map shows you to all the wilderness areas in Colorado (as of 2004). P.S. When God takes a vacation, he comes to a Colorado Wilderness - you should too! When you're looking for a new home consider the new homes in Colorado Springs. New Colorado home buyers know that Colorado real estate is more affordable than ever and with the Colorado property available, there is no doubt that you can find that new Colorado home of your dreams.